Winter has come to the Montgomery Estate Vineyard in Atoka, Virginia. Lucie Montgomery and winemaker Quinn Santori have decided to make champagne, a first for the vineyard. But then Gino Tomassi, Quinn’s uncle, turns up on their doorstep one afternoon, demanding help in solving the mystery of what happened to Zara Tomassi, the first wife of his grandfather, who died in a San Francisco hotel in 1923 under suspicious circumstances. And it seems there’s no coincidence that her death came the day after President Warren Harding passed away in that same hotel. Gino needs answers before his blackmailer takes him for all he’s worth―or exposes an explosive family secret. Lucie searches for what happened almost a hundred years ago as she delves into Prohibition-era Washington, D.C.―a town of bootlegging and duplicity, jazz clubs and speakeasies. 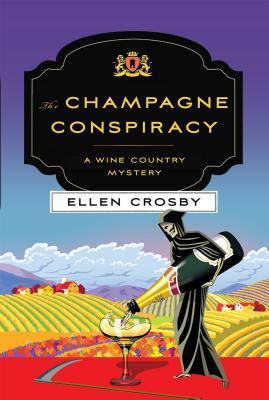 But then the investigation turns deadly, threatening Lucie, her relationship with Quinn, and the vineyard, as they realize someone is still out there nearly a century later who will go to any lengths to keep the truth about Zara’s death a buried secret. This book all begins with a dress found by Lucie Montgomery in her attic from the era of the roaring twenties. After trying on the dress and finding it fit perfectly an idea is formed to have a roaring twenties themed party called "Anything Goes" much like the parties held by Jay Gatsby in the Great Gatsby. The next morning Quinn and Lucie get a visit from a cousin of Quinn's whose being blackmailed about a long held secret within the Tomassi family whose know for having a vineyard in California and supplying wine to the White House during prohibition. Gino Tomassi asks Quinn and Lucie to look into who is blackmailing him and find out if Zara Tomassi his grandfather's first wife who died mysteriously had her child or lost it and what really happened? Was Zara murdered and what happened to the baby? This book brought in all sorts of people within the town and also showed alot of history with the roaring twenties, even involving President Warren Harding and some of it before he was the President. I really enjoyed this book learning the history of Lucie's family and Zara and what happened it was incredible that the author was able to tell the story so clearly that you thought you were there during that time frame! I really loved the wine series can't wait to see what is next!